Using 1-step superimposition, we predict structures of several established relationships that lack an experimental structure. For example, we predicted complexes between DNA topoisomerase 2 and radicicol . The complex of human topoisomerase 2α with its inhibitor radicicol, predicted via complexes of topoisomerase 2α with adenosine (PDB code 1ZXN), yeast chaperone HSP82 with adenosine (PDB code 1AMW) and radicicol (PDB code 1BGQ). We predict a complex between the heart-specific fatty acid binding protein (FABP3) and alitretinoin, using structures of FABP3 with stearic acid and of mouse RXRα with strearic acid and alitretinoin. There is only indirect evidence in support of this interaction: proteins in the wider superfamily of lipid binding proteins show some ligand promiscuity . However, the structural fit of the alitretinoin into FABP3 is striking. The complex of human fatty acid binding protein FABP3 with alitretinoin, built using complexes of FABP3 with stearic acid (PDB code 1HMR), mouse retinoic acid receptor RXRα with stearic acid (PDB code 1DKF) and alitretinoin (PDB code 1XDK). 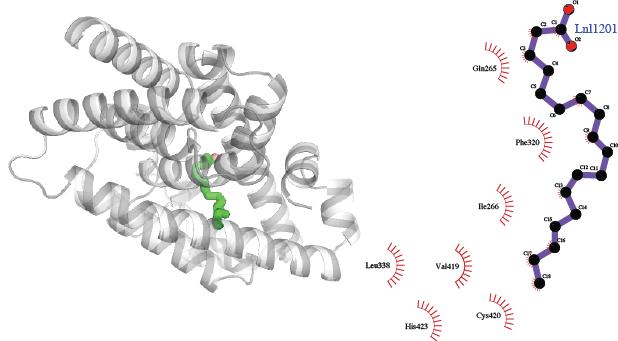 We predict a complex between orphan retinoic acid receptor (ROR) β and α-linolenate made by virtue of a complex between this protein and stearic acid, which also binds to maize non-specific lipid-transfer protein, which in turn binds to α-linolenate. The natural ligand of RORβ is not known; stearate was observed in complex fortuitously owing to the expression of the protein in E. coli . In contrast to RORα, the expression of RORβ is highly restricted to parts of the brain, the retina, and pineal gland . α-linolenate is an essential fatty acid and in humans is a precursor for eicosapentaenoic acid (EPA) and docosahexaenoic acid (DHA), and deficiencies in dietary α-linolenate result in various problems, including learning  or vision . Although these observations could be coincidental, they support the possibility of an interaction between linolenate and RORβ. The complex of rat nuclear receptor RORβ with α-linolenate, predicted using complexes of RORβ with stearic acid (PDB code 1K4W), and maize non-specific lipid-transfer protein with stearic acid (PDB code 1FK4) and with α-linolenate (PDB code 1FK6). Several predictions involve anti-viral compounds in complex with the E. coli transporter Tsx, mostly based on structures of herpes virus thymidine kinase with thymidine, which also binds to Tsx. The kinase has been solved in complex with 12 anti-viral compounds, of which eight fit well into the Tsx structure (e.g., HBPG). The structure of E. coli Tsx was proposed  to be a possible model for drug transport via the eukaryotic equilibrative nucleoside transporters . Our predictions support this possibility, though obviously additional structures of eukaryotic equivalents in complex with model compounds are needed. The complex of E. coli channel-forming protein Tsx with anti-viral agent HBPG, predicted via structures of Tsx in complex with thimidine (PDB code 1TLW) and of herpes virus Thimidine kinase with thimidine (PDB code 1P7C) and HBPG (PDB code 1QHI). All images were created using PyMOL and LigPlot. Gadelle D, Graille M, Forterre P. (2006) The HSP90 and DNA topoisomerase VI inhibitor radicicol also inhibits human type II DNA topoisomerase. Biochem Pharmacol. 72: 207-1216. Velkov T. (2009) Thermodynamics of lipophilic drug binding to intestinal fatty acid binding protein and permeation across membranes. Mol Pharm. 6: 557-570. Stehlin C, Wurtz JM, Steinmetz A, Greiner E, Schüle R, et al. (2001) X-ray structure of the orphan nuclear receptor RORbeta ligand-binding domain in the active conformation. EMBO J. 20: 5822-5831. Jetten AM, Joo JH. (2006) Retinoid-related Orphan Receptors (RORs): Roles in Cellular Differentiation and Development. Adv Dev Biol. 16: 313-355. Yoshida S, Yasuda A, Kawazato H, Sakai K, Shimada T, et al. (1997) Synaptic vesicle ultrastructural changes in the rat hippocampus induced by a combination of alpha-linolenate deficiency and a learning task. J Neurochem. 68: 1261-1268. Okuyama H, Ohishi M, Fukuma A, Sato Y, Ikemoto A, Fujii Y. (2001) Alpha-linolenate-deficiency-induced alterations in brightness discrimination learning behavior and retinal function in rats. World Rev Nutr Diet. 88: 35-40. Ye J, van den Berg B. (2004) Crystal structure of the bacterial nucleoside transporter Tsx. EMBO J. 23: 3187-3195. Acimovic Y, Coe IR. (2002) Molecular evolution of the equilibrative nucleoside transporter family: identification of novel family members in prokaryotes and eukaryotes. Mol Biol Evol. 19: 2199-2210.